Untitled from mike Carlo on Vimeo. I'd really like to talk about my experience so far with making this short film, but I don't know if any of it is important to anyone or if it would benefit them in anyway. It's been a long time since I made a film that told a story, and I've wanted to make one for a long time, but never did. What I know now is that I am having a really great time working on this project for myself, and I am really trying to push the limits of what I am capable of. People in animation seem to complain about not being able to work on projects that allow them to hold their artistic integrity, or show off what they can do, or to create real animation. I am also guilty of complaining about this same thing, but I've changed my attitude in the last year and a half, and I am much better off. I will say this, if you want to do something, then do it. We have all these tools at our disposal, to make films and test animation. Do something for yourself to counter balance any jobs that may not offer you exactly what you want artistically. Go for it! 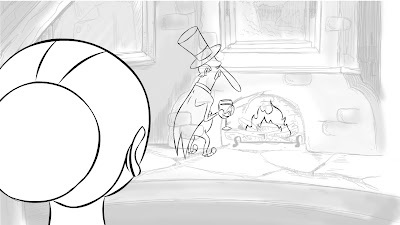 anyways here are two rough layouts from my short. One of them needs a bit of work still. I also posted a very short cllip of animation. Nothing too crazy, just a taste. Enjoy. Thanks! 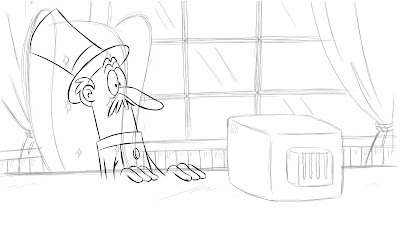 Update: I forgot to mention that I am making this film and showing it at the next Midsummer night toons screening, which will be at m1-5 bar in downtown New York. The screening will take place Wed, june 9th. It's being hosted by Matt Lee, and last years turnout was great and help spawn this years line up. here's the poster, more to come.